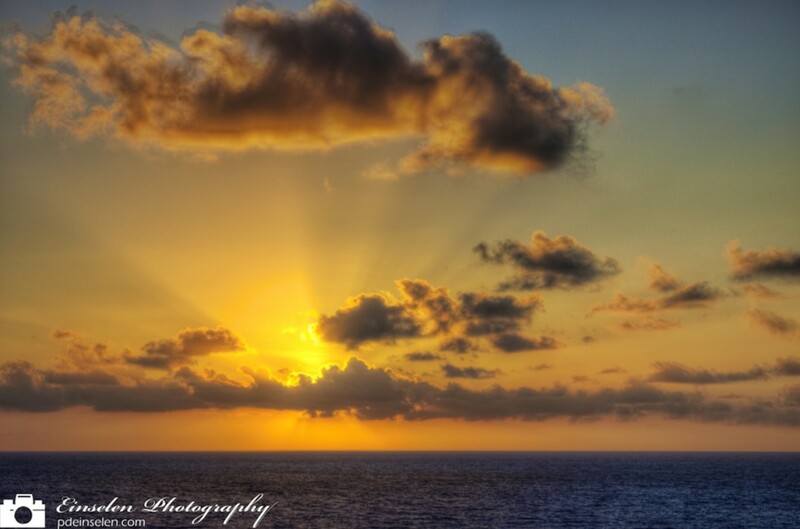 This is a HDR photo of a sunrise over the Gulf of Mexico. Just last week I was able to cruise on the Allure of The Seas, a Royal Caribbean cruise ship. After leaving Cozumel I thought it would be fun to try to capture the sunrise the next morning as the ship would be headed east back to Florida and the United States. It was a beautiful sunrise to capture and the photos do not do it justice. I snapped about 150 photos, with plans to combine them in at least multiples of threes to get the water, sun and clouds all properly exposed in the photos. It was windy so I was slightly worried I would have too much movement and the images would not line up properly, but was glad that all the shots came out better than I could have imagined or expected. I like this one as the clouds have a glow from the sun and then above the clouds you can see the rays of sunshine shooting out in to the sky. There were also a few shots of the sun slightly breaking the horizon which I also thought would be interesting to share. In the upcoming weeks I plan to share more photos from this cruise, including the beaches of Labadee, the port of Falmouth and shots from aboard the Allure of the Seas.